This year the North Market’s Columbus Microbrew Festival (September 13th-15th) promises to be bigger and better than ever. If you haven’t been for a couple of years the event has now moved outside and Spruce Street is closed to allow room for 20 microbreweries, a stage and a beer garden. The North Market hosted Columbus’ first all-Ohio-brewed craft beer festival in 2006 with six capital city breweries sampling their locally brewed beers inside the market building. Each subsequent year they’ve added more breweries and this year, the eighth year, there’s a record twenty breweries. 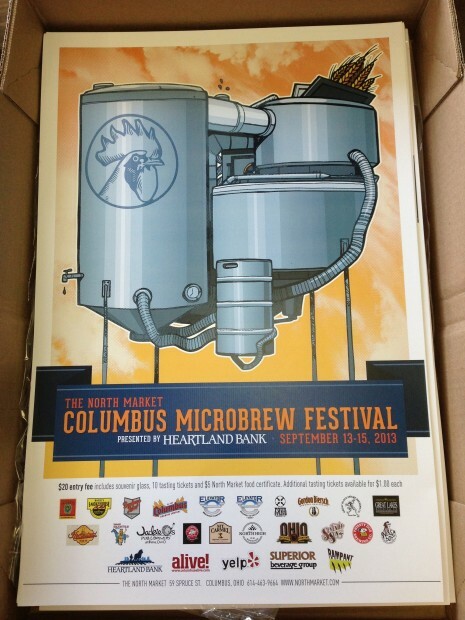 The participating breweries come from all over the state of Ohio with a strong representation from Central Ohio. Participating Ohio microbreweries include: Barley’s Brewing Company (Columbus), Barley’s Smokehouse & Brewpub (Columbus), Buckeye Lake Brewery (Buckeye Lake), Columbus Brewing Company (Columbus), Elevator Brewing Company (Columbus), Elevator Brewery Draught Haus (Columbus), Four String Brewing Company (Columbus), Gordon Biersch Brewery Restaurant (Columbus), Great Black Swamp Brewing Company (Toledo), Great Lakes Brewing Company (Cleveland), Homestead Beer Company (Heath), Hoof Hearted Brewing (Marengo), Lagerheads Brewing Company (Medina), Mt. Carmel Brewing Company (Cincinnati), North High Brewing (Columbus), Ohio Brewing Company (Akron), Seventh Son Brewing (Columbus), Thirsty Dog Brewing Company (Akron) and Weasel Boy Brewing Company (Zanesville). Representatives from each microbrewery will be on hand to answers questions about their signature drafts. Festival hours are Friday, September 13 from 5-10 p.m. and Saturday, September 14 from 12 -10 p.m. and Sunday, September 15 from 12 – 5 p.m. The Market building and prepared food merchants will be open during all hours of the event. Admission to the event and accompanying North Market activities is free. Beer tasting admission is $20 and includes a commemorative pint glass, ten tasting tickets and a $5 North Market food certificate. Discount coupons good for $2 off the tasting admission fee will be available at Heartland Bank branches in September. Additional tasting tickets will be available for $1 each. Tickets are available in advance online, at the North Market business office and at the door on the days of the event. Friday, September 13 from 5 – 10 p.m.
Saturday, September 14 from 12 – 10 p.m.
Sunday, September 15 from 12 – 5 p.m.
Festival hours are Friday, September 13 from 5-10 p.m. and Saturday, September 14 from 12 -10 p.m. and Sunday, September 15 from 12 – 5 p.m. The Market building and prepared food merchants will be open during all hours of the event. For additional information on the North Market Microbrew Festival please call 614-463-9664 or visit www.northmarket.com.